Hi there! Long time, no blog. It’s been months since you heard from Outspoken Media and for that I apologize, but not profusely because sometimes there are moments when you have to take a step back or in our case, a step forward. While we were away from the blog, we were very much present within the company itself. In the past year, we managed to accomplish a lot—new brand, new website, new office, new team members, and most important (to me)—a new human! Having a child shouldn’t be a company achievement, but as the CEO, it’s a luxury that I couldn’t afford until the business was in a certain place. And, until this year, the business couldn’t afford to be without me in it. This is why I believe it’s one of the strongest accomplishments in the business to date. It wasn’t a cake walk–leaning in required some professional sacrifice and a lot of preparation. Everyone in a business should be replaceable, even the CEO. If you can’t maintain the day to day unless a specific a person is there, you’ve created a risky investment that depends entirely on life never happening to that individual. That may be fine in some industries, but in a client-facing business with many employees, I owed it to the team to replicate myself or in this case, enough of my parts to equal the sum. If life were like the movies, it would happen often. Instead, we usually get hit by a proverbial bus—childbirth, death of a loved one, an illness, etc. The last thing you need to worry about in a time of grief or recovery is the daily operations of your organization or department. So, in an effort to make this post actionable, let’s talk about how Outspoken Media prepared for the extended absence of its CEO. In this case the reason was maternity leave, but this could be replaced with any major life scenario. I found my greatest mentor this past year was not another mom, but a local business leader recovering from breast cancer who was thrown into a period of absence and forced to trust her team. My preparation started more than a year ago when I realized I needed the right people on the bus. Rather than looking at this from an individual standpoint, I evaluated the company’s needs and my workload. I needed to be completely honest about the company’s strengths and weaknesses, most importantly, my own. I worked closely with an organizational development consultant as well as an external Board of Advisors made up of other successful, local executives. What I learned from these mentors was that Outspoken Media didn’t suffer from a lack of leads, but experienced manpower, positive cash flow, and a strong operational foundation. The first point is why it’s important to always be hiring great additions to your team. Hire talented individuals who match your culture and vision. However, it’s important to make sure you have an immediate role for them or there will be a lack of focus and/or sense of urgency in their performance. Put the word out about the skills you’re looking for. Sean Stahlman came to us because my friend, Mike King, knew I needed a skilled SEO with an agency background. He also knew Sean was looking for a change and was local to our area. I’d never met Sean, because he spent most of his time in Manhattan or Philadelphia while he was at Razorfish. Each hire on our team has been a mix of good fortune and the result of being open to every possibility. Pearl was referred by a friend who previously worked for a local Ruby on Rails group. Philip walked through the front door after hearing about us from a friend in the local startup space. Amy was referred to us by her cousin who owned a local PR company. Melissa knew about us from The Business Review. I met Chrissy on a local mom group. Notice that not a single one of these hires came from Craigslist, LinkedIn, or Monster.com? I’m not saying that these sites don’t add value, but in our line of work, the best team members come from referrals—people who have already vetted the personality and knowledge of the prospective employee, and who understand the needs of the company. Once I had the right people, I made it clear what was expected of them professionally and this often meant what wouldn’t be tolerated—drama. It may sound simple to say, “no drama,” but when you clearly state this and explain what it looks like in a work environment, things run much smoother. For us, no drama meant no gossiping, no back talking, being actively involved, using constructive criticism, being helpful, and if a problem arose, addressing that person directly unless it required the intervention of a superior. I told the team that if they had drama, it should be about the work or the industry, not each other. When you work hard, you don’t have room for gossip. And, in one year, we’ve had zero issues. Yes, zero. Our company culture is productive, supportive, and passionate. That’s rare. One of the single most important lessons I’ve learned in the past year is that an employee cannot perform the role you’ve given them without proper training. If someone is promoted to management, but they were never trained on what it means to be a manager, they will typically fail. The same is true of any new role or responsibility. Now, when I see horribly mismanaged situations or ineffective communication in a business, I don’t assume that the employee is bad, I recognize that they probably had insufficient training or are suffering from learning anxiety. As the CEO, it is always 100% my fault what happens in this business, so I had to create a routine for effective communication with the team. I needed to evaluate not just their technical proficiency and client management, but personal satisfaction and future needs. Employing someone is a two-way street. I have a role that needs to be filled, but the team has a future that they want to build and they need the potential for growth if they’re going to stick around. Without a clear, personalized plan in place and vision for the near future, there’s no motivation to invest in personal education or long-term vision. Sean and I started doing weekly, individual mentorship meetings with everyone on the team. We’re a small organization, so for now, this works. As we grow, I’ll have to evaluate the time spent on these meetings and how we scale them. Some weeks we skip the meetings if everyone is slammed. Some days one person’s meeting might take 45 minutes and another’s five minutes. The meeting is rooted entirely in the individual needs of the team member, so they feel supported, capable, and confident. This is even more important in an industry that’s evolving daily. We have to empower the team and assure them that their ideas are sound and there’s a clear plan for implementation and ongoing training. In addition to mentorship, we continued to hold After-Action Reviews (which I’ve spoken about often as they relate to achieving business objectives), because the mentorship meetings were to touch on personal growth, not to evaluate performance of larger projects. To effectively manage, you have to teach in the moment or the lesson is lost. The point of an AAR meeting is to quickly summarize how a project went and what skills needed to be learned or lessons shared with everyone on the team for the future. One of the hardest financial lessons of 2012 was cash flow. We found ourselves working with a number of large brands on big projects. This was great—we were growing and tackling more sophisticated work as a competitive, national agency. Unfortunately, big projects and brands often come with a net 90 or the dreaded 120 invoice period and that’s after the invoice was processed. This meant that we worked for free for almost four months without receiving payment. In the past we’d usually worked with companies that were more nimble and we could receive a check quickly. I also recognized that I am mediocre at best with the finances of the business. I attribute this to something many client-facing marketers will understand—it’s hard to invoice someone for work that you’re still performing. You need to separate the finances from client management. Once we hired Chrissy to manage the books she had us ahead of cash flow in no time. We had a clear budget, the books were getting reconciled effectively, and we could start to look into more advanced areas of the business like profit sharing and how to expedite cash flow through alternative forms of payment. Chrissy also evaluated our tool set and was given free reign to question our expenses. This led to the transition from InfusionSoft to Sugar CRM as well as a number of other decisions including a quote for the development of a network that will allow us to check in and out of an individual software licenses for less commonly used tools versus installing multiple licenses on each machine. We’ve never had a sales team. Are you submitting a lead on our site or calling the phone? Then you were reaching (or as was more often the case, not reaching), me! The company phone line was my personal cell until a few months ago and the leads went directly to my personal inbox. There were some points in the business where we would receive more than fifty leads per week. When I’m responsible for the client work, client management, finances, new business, marketing/speaking, HR, education, and operations… balls got dropped. Often. This is the single greatest shame I have in the company. For years I would simply not respond to voicemails or leads, because we were too overwhelmed and I knew that talking to someone would mean an obligation to vet the work, find someone to refer them to (which for five years has proven to be incredibly hard), or we’d have another proposal to add to my growing list. It was easier to simply respond to the most promising leads and allow this crucial area of customer service to flounder. As a reputation management “expert” this is a problem. A gigantic problem. A festering, open sore that needed to heal. We started slowly developing great proposal templates. Then we found proposal software that would allow us to electronically send and accept proposals. We also developed a process where Chrissy would stage the proposals and Sean (in my absence) or I would add the recommendations and pricing. While this worked great for awhile, the number of leads have picked up again to a point where we need someone full-time. I’ve spent more than a year thinking about this role and I have my ideal vision for this person, but still can’t locate them. So, listen up to see if maybe you or someone you know would excel at business development in a growing, nationally recognized agency. Business development is about more than cold calls, so I don’t want someone with just a sales background. We need someone who can filter through inbound leads, respond to everyone, refer folks out to partners (and vet those partners through meetings, calls, and follow-up), write proposals, follow-up with potential clients, field questions, and strategize ways to drive more qualified leads. We want an industry expert who can hold his or her own in a discussion on the latest Google updates, but also has enough historical context to not be reactionary to them. They need to know which industries are over-saturated and they should be able to sniff out spam a mile away. This person should also be a marketing powerhouse. Like me, I want a “name” who can drive leads simply because of who they are and what they know. They will blog, speak nationally, connect socially, organize strategic events, develop partnerships, and most important—also tackle 5-10% client work so they’re always kept in the loop with our methods and client management. Know someone? Is this person YOU? You must be willing to relocate. Message me direct (rhea at outspokenmedia dot come). Maybe something mushy happened to me on maternity leave, but suddenly I felt very maternal not just with my child, but the company. I know a lot of this came from how I viewed my husband’s flexible schedule (or lack thereof). It’s important to me that our team feels taken care of and like they belong to something great, not just another 9 to 5. Security is the single greatest motivation after food, water, and shelter. As a business owner, I hear a lot about the fifty-person company. Fifty employees is the magical number where everything changes. Growth feels scary when you know this number is approaching and suddenly you’ll have to accommodate more regulations. I didn’t want to wait until we hit fifty employees to offer those kinds of benefits. I wanted to start today with whatever we could reasonably tackle. The easiest of which (and most urgently needed) was a lactation room. This may sound simple to some, but for a nursing mother, the physical need to pump breast milk is a painful, anxiety-ridden situation that often leads to giving up on the whole process. The decision to nurse or do formula is a personal choice, but for a mother there are health benefits to nursing, not only for the baby, but the mother herself. I wanted to give mothers (and myself) the best opportunity possible to successfully do this by accommodating their physical and emotional needs. So, we created a little area in a call room that’s blocked off, set-up a white noise machine, and went a step further by renting a medical grade pump so moms don’t have to bring their own equipment into the office. There’s nothing that screams “I’m a mom!” more than lugging your bag of parts around and for a new, sleep-deprived mother, trying to remember all of the pieces as well as your child and work necessities, is near impossible. No wonder so many moms return to work part-time or not at all. Curious about other agencies’ maternity leave policies, I asked several and found that many provide a bonus to mothers who return to work, but few do. We need to make it easier for parents (regardless of gender) to have the flexibility and support they need. When Outspoken Media formed, I wasn’t the CEO. I knew that one day I would want to be, but I didn’t have the leadership or management skills needed to do so then. Years later, when the first partner buyout came, I assumed the role of “acting CEO” and eventually realized that I had no desire to relinquish control to some suit just because I didn’t look like the picture of a CEO in my head, especially after performing adequately in the new role. However, I still didn’t feel fit for it. After being honored as one of the Capital District’s 40 Under 40 this year (three months after my 30th birthday), I finally feel like I deserve this role. It took a lot of mistakes to get here, but I’ve grown from each lesson and become a stronger marketer, leader, and person. Having finally come into my own as a CEO, it was time to step into a far scarier role—mother. I knew that motherhood would bring uncertainty. After the birth of my son, would I still have the desire to run the business? That was the single biggest fear I had. Would I fall so completely in love with my child that I would give up my first baby (Outspoken Media) to be with him? I knew that financially my family couldn’t afford that choice, but emotionally, I soon discovered that I needed the business and my worries were unfounded. The company is a part of who I am and I want my son to see what I built, especially since I don’t come from an entrepreneurial family. I want him to know that you create the path you want in life and everything is possible with hard work, a positive attitude, and an eye for opportunity. It was important to me that I return with a flexible schedule, so I could still spend as much time with my child as possible. And, I wanted those flex days to have opportunities for work, but not client work, because I’d managed to get out of the day-to-day affairs and it was important this continue if I was ever going to embrace my role as CEO. I had to be more outward, more entrenched in the industry, doing more research, developing partnerships, finding team members, marketing the business through my writings/speaking, etc. I couldn’t do that if every workday was spent on client calls and reviewing the team’s work. I had to trust that I had trained my team and Sean would take the lead with quality assurance. I would still be on the monthly calls, available to the team for any questions, and reviewing performance, but no more micro managing or hand-holding. But first, I had to get through maternity leave. Maternity leave? What’s that?! I mean, Marissa Mayer popped a kid out, took two weeks off and was back in the office. Who needs maternity leave these days? Well, as I quickly learned, what works for high-powered executives with a large team of support and limitless funds, does not always work in the average American’s life (as most of us undoubtedly realize and truthfully, so does Marissa Mayer who recently extended parental leave and added a ton of other benefits). And, for many new parents, regardless of the financial and physical demands of having a baby, there is an intense emotional need to bond with your kiddo. My situation turned out to be a bit extreme as well. Without going into the details, the baby came three weeks early, on Mother’s Day, and we had a month of complications following the labor. Both my son and I were in and out of the hospital for various situations, but today we’re both very happy and healthy. 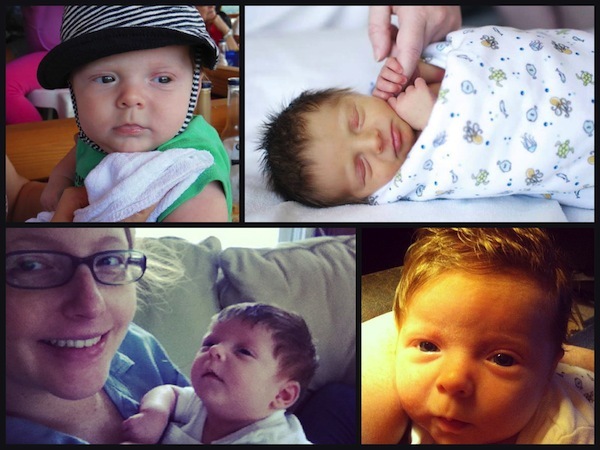 I’m not going to pretend like my son’s birth was the best day of my life, because it wasn’t. It was exhausting and painful and I was mad at him when he was born for putting us through such a difficult labor. As a new parent, I spent the next few weeks fumbling through life with torturous sleep deprivation, emotional highs and lows, and a paralyzing fear that at any moment I would do something to hurt my child. As any parent knows, there’s no greater emotional torment than feeling helpless with your new baby. Those first few weeks were physically and emotionally debilitating. Slowly, as the “baby blues” went away and our son grew older, I regained some sanity and perspective. And today, aside from still not getting much sleep, we have our routine and my husband and I are totally in love with this little man. The best day of my life came when he smiled for the first time and each day since as he finds his laugh. It’s magical to watch him discover the world. Most parents can relate to the above. Now, for business owners, managers, and team leaders, you can also relate to the longing I felt to return to my business. During delivery, I was still taking calls and responding to emails. 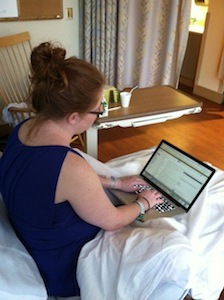 A week after my son’s birth, I was sitting in the office, running through the status of client work. 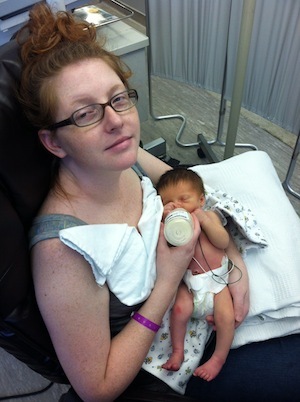 That evening, my son went into the ER and spent the next three days in the NICU. Talk about a sledgehammer of guilt. I felt like I was being punished for returning to the business a week after labor. The GPP (Good Parent Police) had seen me sitting in the office with my newborn and decided to hurt him for my transgressions. I now realize that we’d both been recovering from the labor still and to prove it, our bodies put us out of commission for three more weeks. By the time we’d fully recovered, my four weeks of maternity leave were up and we hadn’t even had a chance to bond or establish a routine, yet! So, I took more time. I checked into the office as much as I could. I’d bring my son with me and the team was great with both of us. I couldn’t ask for a better team to have gone through this with. Now I get what maternity leave is about and I never want to see a parent rush back to work for fear of their job or mismanagement of their workload. Likewise, being a parent has made me a more capable leader and it is with this perspective that I returned to work and you, our loyal friends and community. Thank you for letting us do what needed to be done as a business and for me personally. We are stronger for it, and this time showed me that it’s okay to let go of certain areas if you always remain focused on the three most important: the team, the work, and life balance.